Orthographic Projection is a way of drawing an 3D object from different directions. 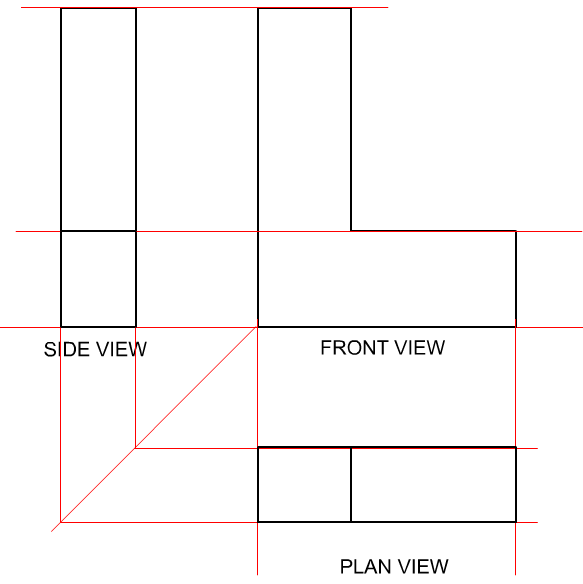 Usually a front, side and plan view are drawn so that a person looking at the drawing can see all the important sides. Orthographic drawings are useful especially when a design has been developed to a stage whereby it is almost ready to manufacture. IMPORTANT: There are two ways of drawing in orthographic - First Angle and Third Angle. They differ only in the position of the plan, front and side views. 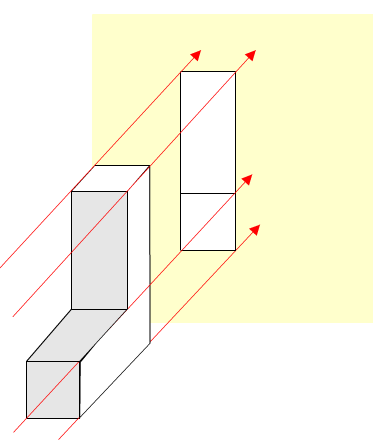 Below is an example of First Angle projection. 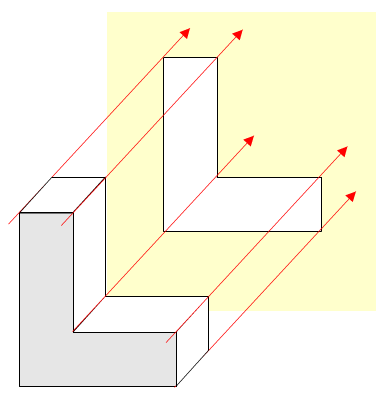 Opposite is a simple L-shape, drawn in three dimensions. The front, side and plan views have drawn around the 3D shape. However this is not the correct way of drawing them as they are not in the right positions. 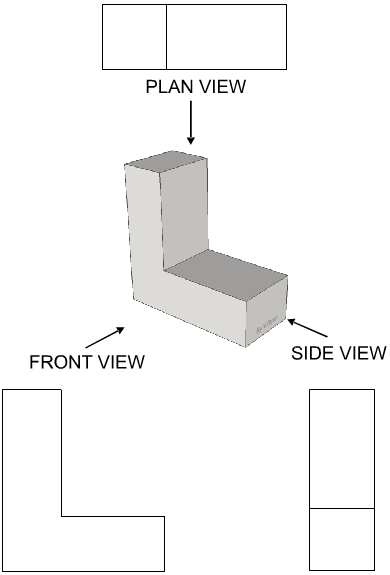 The correct method of presenting the three views, in first angle orthographic projection is shown below. The drawing is composed of a front, side and plan view of the L-shaped object. The first drawing is the front view (drawn looking straight at the front of the L-shape), the second is a drawing of the L-shape seen from the side (known as side view) and last of all a drawing from above known as a plan view. The red lines are faint guidelines and they are drawn to help keep each view in line, level and the same size. Imagine standing directly at the side of the L shape. Now imagine standing directly in front of the L-shape, the drawing opposite shows exactly what you would see. The plan view is a view seen directly from above. Some people call this a birds eye view. Draw an orthographic projection of a H-shape. Clearly show the front, side and plan views and use guidelines to keep them level. Carefully study the symbols shown below. 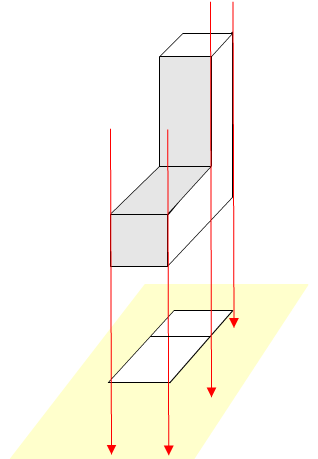 Normally when drawing in first or third angle projection a symbol is drawn underneath which clearly shows which angle of projection has been used. 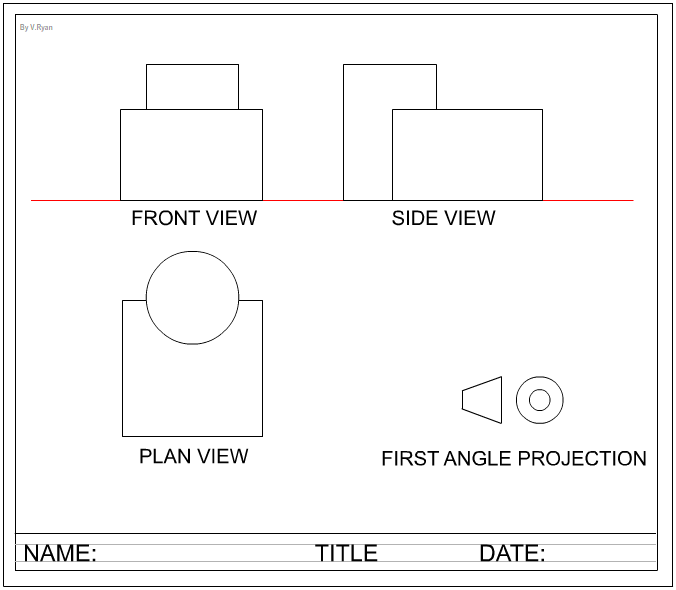 Another example of first angle orthographic projection is shown below. Follow the blue, red and green guidelines as the front, side and plan view are constructed. The final arrangement of the views are shown in the drawing below. Notice how the symbol for first angle orthographic projection has been added and the paper has a title block and borderline. Select a simple three dimensional object and draw it in first angle projection.